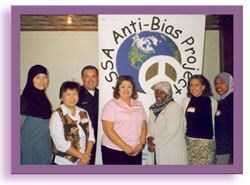 The ISSA Anti-Bias Project’s objectives are to increase knowledge, skills and awareness about the Muslim community, its traditions, beliefs and practices in America. As the social issues in Muslim communities are increasing, so to is the need to establish social services that are Islamically based and delivered based on the Qur’an and Sunnah of Prophet Muhammad. Marital problems among Muslims in North America are of increasing concern. Issues like divorce and domestic violence are taking their toll on Muslim families. Even though Muslims in North America experience a unique set of circumstances and are diverse in their culture and road to Islam, the Qur’an and the Sunnah have the methodology for preventing and resolving the problems that we face. This workshop aims to educate Muslim communities on the harmful effects of violence in the home, community and that it not permissible in Islam. Workshops can be offered in conjunction with Establishing Social Service Workshops or tailored to the needs of the community. Workshops for secular and other faith providers are offered concerning how to effectively help Muslim survivors of domestic violence.